Pax Jerusalem (1999) by Mark di Suvero, Lincoln Park, outside the Legion of Honor. The parking lot in front of the Palace of the Legion of Honor was empty just before the museum’s opening time. It was a clear day and the long red beams of di Suvero’s industrial sculpture glowed in the early morning light. From this view, the beams seem to be measuring the sky above the palace like some mysterious astronomical instrument. 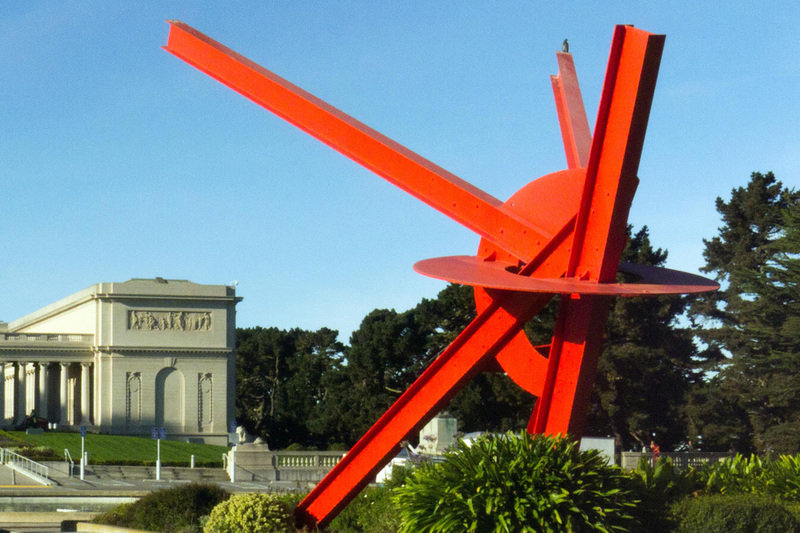 The irony is that the Fine Arts Museums spent precious acquisition funds — they will not say how much — on a mediocre work by di Suvero, a native San Franciscan justly renowned as an abstract sculptor. Six years earlier the museums fumbled the gift of a major sculpture by another native son, Richard Serra, also a world figure in art. He and di Suvero were boyhood pals. –San Francisco Chronicle, Sunday, July 16, 2000. Public Art always seems to bring out the best in critics. You have a few days left to see this stunning selection of decorative art from French royal palaces. The show is beautifully mounted. Don’t miss it. This entry was posted in Places, Public Art, San Francisco and tagged Palace of the Legion of Honor, Photography, Postaweek, Public Art, San Francisco, Treasures from the Louvre by carto. Bookmark the permalink.